Hey there Darlings! Been a while I know. Lot’s of crazy busy stuff. Family gone crazy, Seras get’s a mortal job, the little Psychotik figured out how to vaporate, and some how a Carnivorous Raglefant Troll from my laboratory. By the way if you live in Florida and see this very large creature with very large teeth…I advise you to run as fast as you can. Getting back to business, I have a very special interview to hand over. 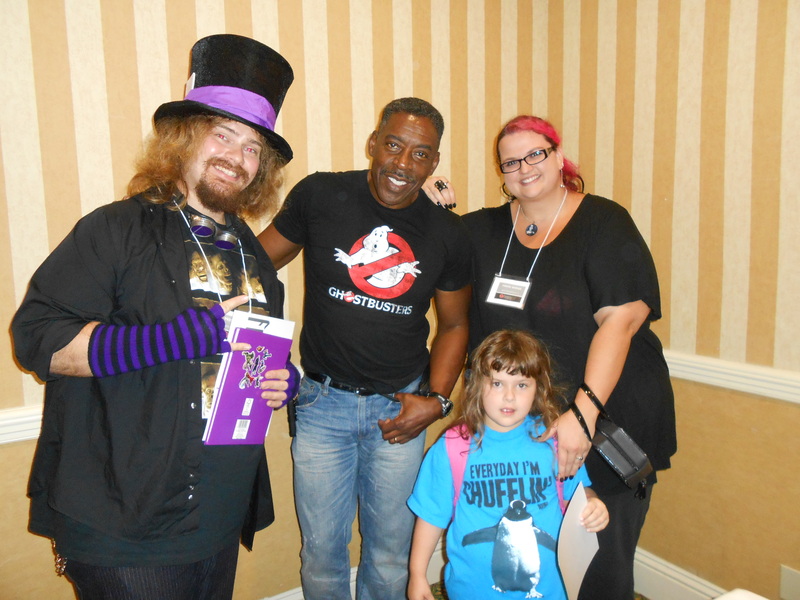 At Fatality Fest back in June I had the pleasure of meeting the one and only Ernie Hudson. I was thrilled! 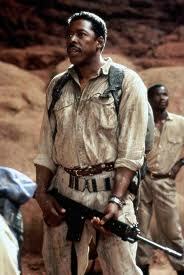 This man is in two of my top all favorite movies of all time. It was such an honor to meet such a film icon. 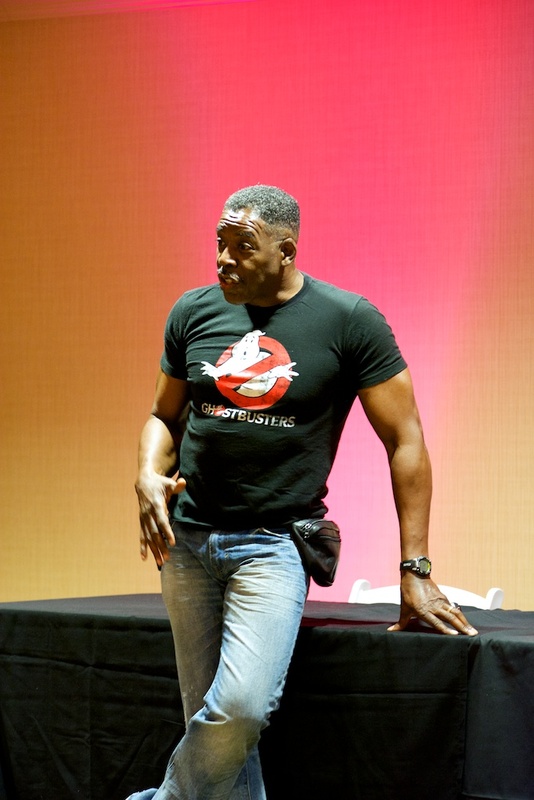 So get the proton packs ready, and don’t cross the streams…. 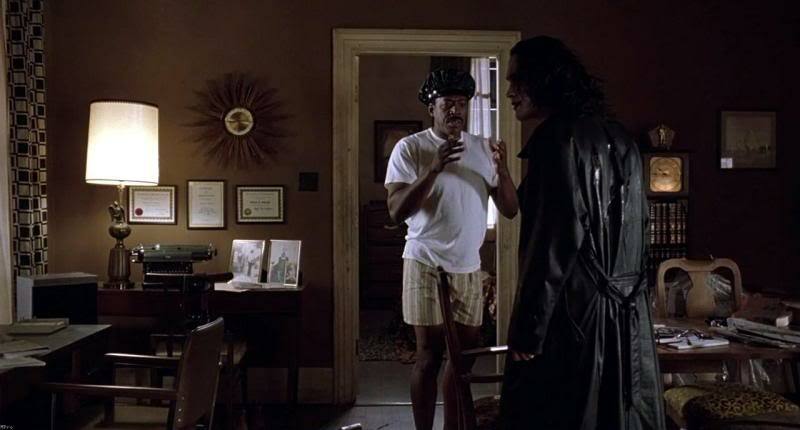 Malice Psychotik: You are in my top 2 favorite films, The Ghostbusters and The Crow. But your career goes a lot further than that. Do you have any personal favorites out of all the movies you have done? 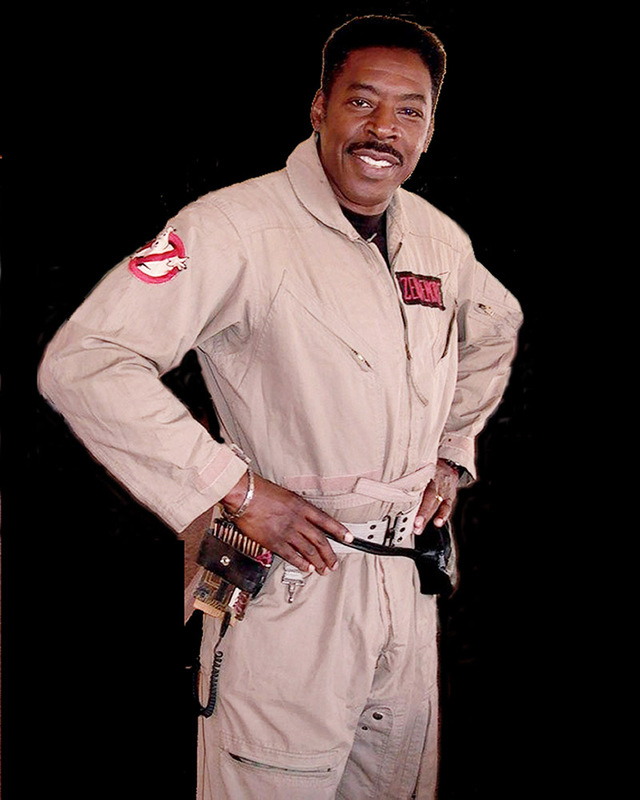 Ernie Hudson: No I just like to work and some films turn out a little better than others but I just enjoy working. The Ghostbusters movies, The Hand That Rocks The Cradle, Congo, The Crow I love those. You always put your best in and some turn out good and some don’t. MP: One of the biggest debates between Ghostbusters fans is, which one is better 1 or 2. Was there one that you liked better? EH: I think the first movie was more original. I think it was actually a great movie. The second one was more family friendly but not as creative. So for different reasons I like them both but I just thought the first was really out of the box and just really original. The second one wasn’t as original but little kids find it much more accessible. MP: The video game, what sort of experience was it? You guys hadn’t been together in so long. EH: Yeah I think we all love the franchise and we all got together. I was happy and surprised they got Bill Murray to do it. But they did. It was nice to come together again and put something out there for the fans. I wish we could have followed through and did the third movie. That has yet to happen but it was great being a part of the game and it turned out to be very popular with the fans and that’s good. MP: You mentioned Ghostbusters 3. I know you can’t really trust most movie buzz going around but have you heard of a script or anything in the works? EH: No I hear from time to time from Danny Aykroyd. I talk to all the guys including Ivan Reitman so I think everyone wants it to happen but getting everyone to agree on exactly what, that’s been the problem. I hope they can pull it together. I think the fans have been great, supportive and I think they are ready for it. They would love to see it. MP: I had looked through your IMDB and saw a little known fact that you were up for the role of The Master in “Doctor Who”. How did you come across that? Are you a big “Doctor Who” fan? EH: Not a real big fan. I mean I’m aware of the franchise and I had heard that I was being considered but of course it never happened. I think Eric Roberts ended up doing the part. But that would have been nice, would have been fun. Then when they did “Torchwood” which is an American spinoff, they asked me to be a part of that if the series went but the series didn’t go. But it would have been fun to be a part of that. MP: What do you think you would have brought to the role of The Master? The Master’s character is such a sinister villain and you tend to play a heroic, very nice guy. What depth do you think you could have added to the character? EH: Well I think nice guys make the best villains and sometimes the villains can make the best nice guys. I think it’s very hard for an actor to get locked into a certain thing. I have done a number of movies where you play the other side. It’s always interesting and I think it would have been an interesting challenge to give that character a different dimension. Obviously me and Eric Roberts are two very different people. I love his work but it would have been interesting to explore that. MP: I have noticed that in your roles you play a police officer a lot. In Miss Congeniality you play the director of the FBI, The Crow you play Sergeant Albrecht, and there have been several others. Is that a personal preference for you? EH: No, most actors don’t really get into personal preferences. You take the jobs that are there and available in front of you. Actors talk about well I turned this down and most actors don’t turn anything down. There’s not that much work out there. A lot of times people will take my voice, my physique I’m sure it probably comes off very authoritative and that translates into authoritarian roles. Be it a principal, warden, whatever. The FBI guy, the CIA guy and so I think that’s where a lot of that comes from. I have been very fortunate to play other roles. I think it has more to do with physicality than anything. I try to be as flexible and try as many different things as I can. MP: I read that you like writing. What sort of things do you like to write? Screenplays, short stories, etc. EH: I started out as a play write. I got a scholarship to Yale as a play writing student back in the 70’s. I still write. I’m working on Jack Johnson the first black heavyweight champion “One Man Show” I’m writing that. Still working on the script but hopefully I can get that out there soon. Writing was very much a part of my life for a while. Then I sort of got more involved in acting trying to raise my family. But now that I have more time, I want to get into that side of my career. MP: I had one question about The Crow but I know usually that is a tender subject. Do you mind? EH: No, no! Whatever it doesn’t matter. The Crow, if it was going to be Brandon’s last movie I am very happy that I was there and I have nothing but great love and respect for him and his memory. So I don’t have a problem talking about it. MP: How did you come across the role of Albrecht? EH: Well, I’m sure Brandon probably had a lot to do with it. I had known him for about 8 years and I know he wanted me to play that role. I thought it was a great role! I liked the character. I don’t think any actor knows how they get anything. How they got this part, that part. Maybe some who could say I got this from who knows what. As an actor, you’re out there and you try to get the role. I can’t honestly say Brandon got me the role. It could be any number of reasons. MP: Did you ever read the comic books before you took the role? EH: No. When I was a kid I read the Marvel comic books and some of the DC stuff but I’m not really into it. I was a single parent at 19. I raised 2 sons and so most of my life has been trying to keep a roof over their head. I never was much into the comics. I never read The Crow. Obviously once I got the role I got into it but not before. MP: One last question just kind of out there. Fitting with Ghostbusters, do you actually believe in ghosts? EH: I believe in the possibility. I can’t sit here and tell you that I saw a ghost clearly last night and they said to say hello. I think there are other dimensions around us that we are yet to understand or even be able to comprehend. It’s like a computer. If you have one of those old computers that are very limited, it can’t process the newer stuff. Because it doesn’t have the capability. We have 5 senses and that’s it. I believe the universe is infinite so who knows how many other senses there are. In our realm of 5 senses it doesn’t exist. I think it would be very foolish to believe there is not something else going on. So I believe in the possibility but it’s not something that I go around in pursuit of. I’m not fascinated by it. I figure sooner or later we’ll all know for sure. Malice Psychotik: Your first film was Poltergeist at the age of 10. How did you land the role? 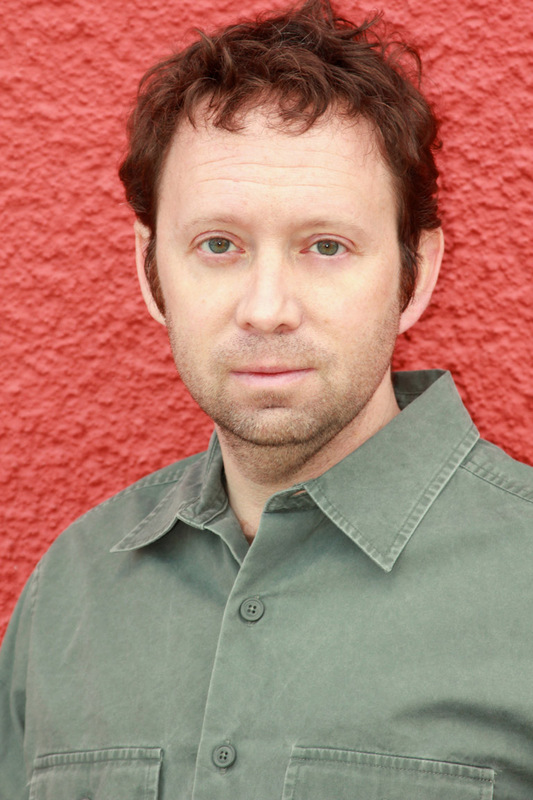 Oliver Robins: Well you know I had only been acting for a short period of time and I had only done a couple of commercials and it was an open call. Hundreds of people were called up at this audition and we were waiting outside MGM amongst the hundreds of people. To make a long story short, after a series of call backs and auditions for everyone including Mr. Spielberg, they said their one concern was I didn’t know how to scream. And Toby said to me that the key to a great horror movie is someone who knows how to scream. So I panicked! “What am I going to do mom?’ So I met with a coach and this person, believe or not in Hollywood there are people who specialize in helping you learn how to scream. OR: Yes! So I learned how to scream. learned how to take it up from my chest and diaphragm and that’s how I won the role. MP: You’ve got one hell of a scream in the movie too! MP: Were you ever actually scared by what was going on? OR: No you know what’s funny, they shoot the film entirely out-of-order and you get kind of bored. And while I was bored, I actually began watching what they were doing and that’s what got me into the film making process. That is what made me want to become a filmmaker. And Mr. Spielberg gave me a Super 8 camera and I started making films out of it. Not out of it but I started making films from that experience. And to answer your question in long form, everything about a movie is about the special effects. I mean a movie like Poltergeist that is. And all the stuff is put in afterwards so I was never actually ever scared because we didn’t know what to be scared of. When you see us screaming at the various effects, they were waving a stick and we were like what are we screaming at? They said “we have no idea yet”, it was going to be layed in by ILM and that’s the scariest thing you can think of. MP: So when you actually saw it in the film, did you just say “whoa!”? OR: It’s funny because when I actually saw the movie, I jumped! I was scared when I actually saw the film. And I had no idea what I was actually going to be looking at and I’m looking at all these ghosts and creatures flying around. MP: could you tell us about the scene where the clown doll comes to life? I was reading that the arms actually wrapped around your neck and you turned blue. OR: You know what’s funny is I don’t remember that. But it was a very fast shoot that day. Believe it or not like the tree sequence took almost 2 1/2 weeks to shoot. This sequence was shot in a matter of hours. Maybe like half a day, 5 hours of shooting. The way they did it was tedious. More tedious than scary. They used a reverse camera so I had to start at the pinnacle, the climax of my fear and had to act backwards. And so I started up at my highest intensity and go to my lowest intensity so when the movie was played forward, it was as if the arm was wrapping itself around me. And in the different pieces of coverage, they broke it up to look like as if I were being dragged underneath the bed. My understanding is the clown dolls arm caught around my neck. I guess I put it out of my mind because I can’t even remember what happened. MP: Oh wow! Must have been very traumatic. OR: So traumatic I just forgot about it. All I remember is having a great time on set. I didn’t really have that many scary experiences. For me it was like going to summer camp. Everyone made that shoot a happy place for me. I mean everyone from Frank Marshall to Steven Spielberg and Toby Hooper. You couldn’t ask for a better team of people. I remember Frank Marshall on the set. He was telling me about all the sets they built and he said it’s going to be great! we have all these things you can play with. All these toys and everything else. So it really made it feel like summer camp for me. It wasn’t an awful experience at all. And he never played any tricks on me to get me scared. MP: At age 15, you wrote, directed, and produced The Crystal. How did that compare to your acting experience? OR: I think acting really helped me as a filmmaker. Because what a lot of directors don’t understand, they’re very technical filmmakers. To understand what an actor is going through is invaluable. So by acting prior to directing, I knew the kind of performances I wanted and how to talk to actors. I understood a certain sensitivity an actor is feeling. So all of that really contributed to my ability to direct. And I think it’s critical that all directors act once or at least take an acting class. So they understand not just the technical side but also the aesthetics of acting. So my experience helped me to not just direct actors to get the coverage but how to best get the performances and cater to an actor. MP: you have written, directed, and produced around 50 films. Which has been your favorite? OR: I loved working on this Hallmark movie that I wrote obviously for the Hallmark Channel. But I almost think that Hallmark movies are a genre unto themselves. The kind of movie I could watch with my grandparents. It’s a very wholesome and sweet movie. I have made films that are a little more adult. I love making something for television that is timeless. I think they have shown it over 50 to 60 times. It’s this story about a young boy who befriends this outsider in the town and helps him build a soapbox racer. So they need each other in their own special way. The boy becomes a champion and at the same time, helps this recluse in the town come out of his shell and discover the kind of person he has the potential to become. I love that Story. It’s a very sensitive story and I was really inspired by Cinema Paradiso. That was my inspiration or prototype. And I just put the Americana into it. MP: Are you currently working on anything you can tell us about? OR: Right now I’m working on some studio projects. I have been signed to secrecy but I’m working with one of my film school partners. We’re really hopeful this thing will get made. We had to sign off and not give any details about it right now. But that’s what I’m working on right now. MP: Have you ever thought of returning to the horror genre? Like a ghost movie or something of the sort? OR: As a filmmaker I would LOVE to do a horror film. I’ve written a couple of pieces, but as you know, it’s really hard to get something off the ground. I would love to have the opportunity to write a horror movie and direct if possible. MP: And it’s such a shame that Hollywood is obsessed with this concept of remake, remake, remake. And no one is willing to go off and take a chance on a new idea. Very seldom do you see that. It’s like they are obsessed with recapturing the old days. OR: I agree. I think there is a concern because films are so expensive to make that they want something certain. That they want to know the film will make money at the box office. So I think that has prompted a lack of creativity. I think that’s why we are seeing a lot of derivative films. Not just derivative, but remakes and sequels. I think they just think they have sch a fan base already. But if people took more of a risk, I think you would see a lot more original movies. Eventually that day will come, when they run out of sequels to make, and we see a whole new set of fresh film makers. it doesn’t take a whole lot of money to make a great film. It takes a good story, good performances , and a fresh directorial vision. I just hope that executives will start taking chances again like they did in the 70’s. MP: OK last question, Poltergeist was the original ghost movie. Or at the least the one that made the sub-genre famous. 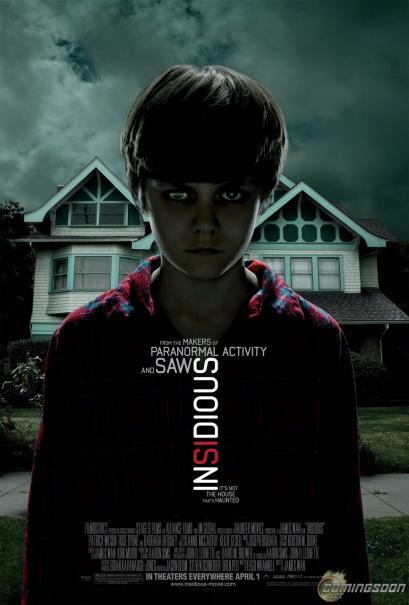 How do you think that stacks up against the films today like Paranormal Activity? OR: A movie like Paranormal Activity is drawing off of what Poltergeist started. 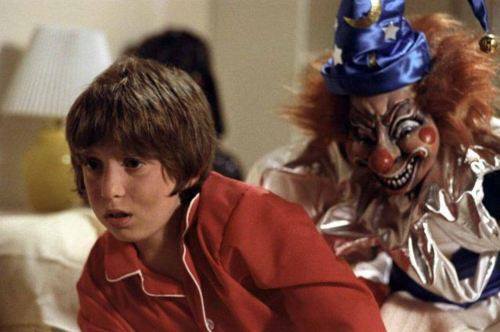 Without Poltergeist you probably couldn’t have a film like Paranormal Activity. You have this set standard of what is a Poltergeist is, because no body really knew before then. It’s kind of like a stepping stone. When ever I saw Paranormal Activity, I was terrified. I was at the edge of my seat. I thought it was brilliant that they could tell a story that basically takes place in one place. entirely in one location. That’s where Poltergeist is a very different movie. It’s more of a family horror. It’s really about a mothers love for her daughter. Paranormal just doesn’t draw from that. And that makes the two films entirely different animals in the genre. I hope you all enjoyed that as much as I did. I really enjoyed chatting with him. He is a very friendly person and makes you feel like an old friend. Can’t possibly say enough good things about Oliver. I do hope to hear more from him soon. And believe you me, if I hear of anything I will let you all know. Stay tuned for more in this series of interrogations…I mean not forced interviews! Ha Ha Ha! Hello, Freaky Darlings! Welcome to another Psychotik Review. 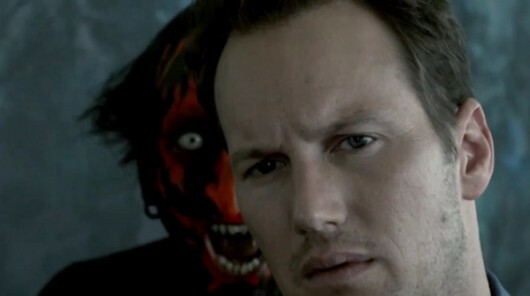 The subject of tonight, the creepy craze sweeping the horror community, Insidious. This was a hard movie for me to review. It took me some time to organize my thoughts about it. I didn’t really know how the movie made me feel. I’ll get into all of that below, the most I will say before we get into this is: For once I have a movie I’m reviewing that I can actually dissect…. The story starts out with a pretty regular concept of paranormal activity and moves to a more interesting one. You have some basic bump in the night sort of stuff, cheap thrills really. Then you move into the main act when one of the main characters little boys falls into a strange coma. You immediately get the feeling this coma is completely paranormal. Unless of course you think the ghosts and other activity have nothing to do with it. It get’s so bad our family moves to another place. Big surprise, it doesn’t go away. You are introduced to some rather cool characters through the course of all of this mess (I’ll get to that in a minuet). The story comes to a head when a psychic is called and she reveals a family secret that the father is astral projector as well as the boy. You see what happened is, the boy projected away from his body and is lost. It’s all up to super dad to go on a hunt through “The Further” to find his little boy before some ghost or a little Red Faced Demon (Code Named Darth Maul Demon…Seriously, check it out) posses’ him. Now That I have that out of the way, let me explain what I thought of it. The plot is a good one…if only it would have decided where it was going. To me the movie felt like it was all over the place. Like it just kept jumping around without ever resolving anything. It was entertaining, but there was one spot toward the end that I was just like “How the hell did we get here?” That’s not the actors fault….Not even really the Director….thats more a writing sort of thing. Unless of course the Director cut a few scenes that would have made more sense. You just never really knew who the real threat was. It sort of settles on it…and then it just totally goes out of the way to piss on that as well. You’ll get it at the end. This is where I can give them a lot of credit. The movie really did have top-notch casting. Patrick Wilson, Rose Byrne, Lin Shaye…even the creature actors J. Larose, Joseph Bishara, and Philip Freidman. They all do a wonderful job with the roles they have. 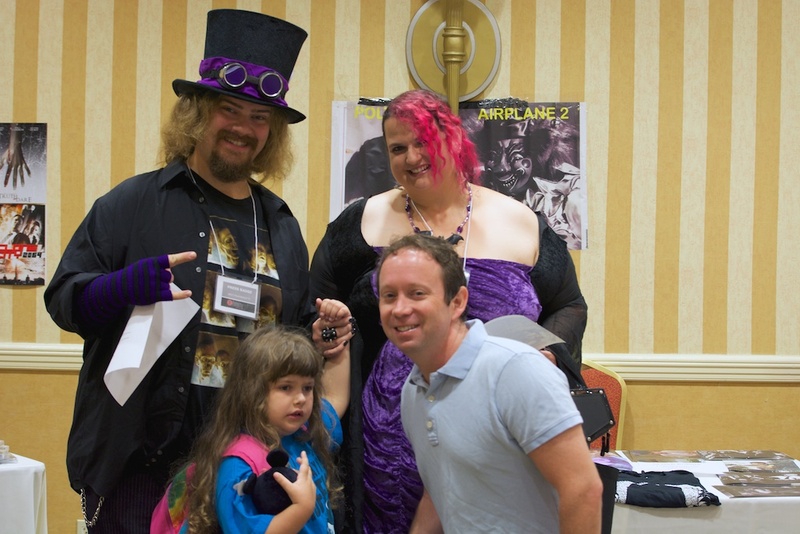 I more give credit to Lin Shaye and her team of paranormal investigators…they were awesome. The creature’s did a good job at their being creepy. The old lady and The Long Haired Fiend are the things that horror legend is made of! I just wish they would have had more screen time. J. Larose and the Demon were the most frighening. They just didn’t offer them enough screen time. Again another problem with direction and writing…On the whole though, I say Acting was a big plus. The movie get’s a solid 3 out of 5 Top Hats. It really wasn’t that bad, but it wasn’t that good either. Definately don’t go into it expecting a horribly frightening thing. I had to wait to do this review to form my own opinion because I went from the hype and was grossly disappointed. Think I was too harsh…Click Here for an alternate point of view! That’s all for tonight Darlings…do stay tuned for more madness to come your way. Hopefully some short stories soon. Definately another review or two…. P.S. I found this scene while looking through YouTube. It had potential to be a very eerie scene, but due to poor judgement in cinematography, the scene is only visible if you are looking for it…This will show you a perfect example of my frustration with the films delivery on scares…enjoy!